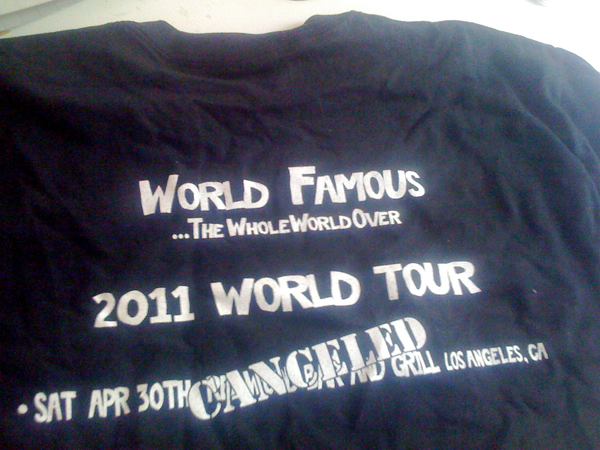 Only 4 left of this extremely rare t-shirt from Trinket's World Famous, the Whole World Over cancelled tour. M, L, XL, and 2XL The band rehearsed for the tour at Adair Street and many a late night has been spent around the campfire singing their songs. T-shirt comes with stickers. When ordering, please specify size as a little note. All proceeds go to help defray healthcare expenses for Tucker.